MHI has been involved in two projects to promote community publishing, using creative skills from members of local communiites using their own languages to develop reading materials for children in their own languages. First Language First: Our first project was a collaboration between MHI, Alola Foundation, Ministry of Education (Government of Timor-Leste), Kids' Own Publishing and World Vision. It combined development of children’s books in mother tongue languages with promotion of education and engagement in reading and learning in rural areas in Timor-Leste. Sarah Daley, former AYAD volunteer hosted by MHI in 2011, was employed by the Alola Foundation to support local staff, teachers and other educators to deliver this project. Creative input and training on children’s book development was provided by Victoria Ryle and her staff at Melbourne based Kids' Own Publishing. 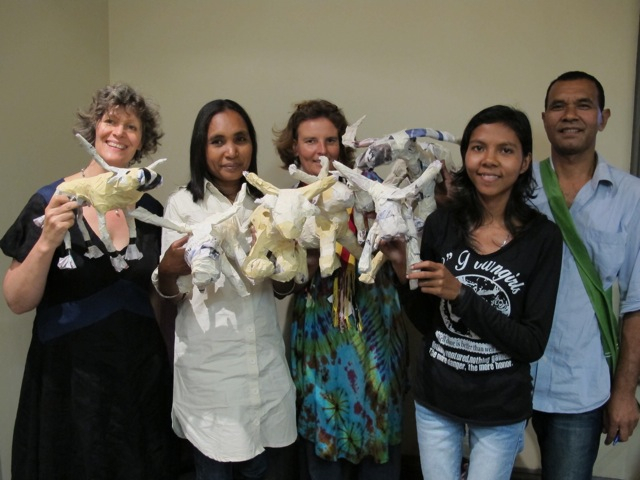 The first activity was a community workshop held in early February 2012 for the Timorese community in Melbourne through the Melbourne East Timor Activity Centre (METAC). This ran concurrently with a professional development placement for four Timorese staff who undertook three weeks of training in with Kids’ Own Publishing. To give the trainees hands-on experience, children from Timorese families living in Melbourne worked with them and Kids’ Own staff to create two beautiful books. Both the community workshop and training program were highly successful. The project ended with 19 children’s picture created by local communities in regional areas of Timor-Leste working with project artists being published. 500 copies of each of these titles were distributed throughout the districts in Timor-Leste by UNESCO, who are training teachers in local primary schools in use of mother tongue as the language of instruction. This strategy is intended to address the very significant issues in early years education in Timor-Leste, where many children after two or three years at school cannot read a single word in any language because their education is primarily in a language they do not understand. The new picture books produced by the First Language First book publishing project are in the national language of Tetun and in a number of local languages, including Fataluku and Galolen. These are amongst the very first children’s picture books ever published in these languages. The books are beautifully produced and full of original artwork and stories created by participants in the development process. We hope they will inspire more engagement with reading from many new young readers. Fataluku children's book project: Our second project was initiated by MHI staff member Natasha Trenear who create dtwo gorgeous childrens book in Fataluku language during her visit. More here.